Sarah L. Stewart of Manchester became the commissioner of the N.H. Department of Natural and Cultural Resources on June 4. In addition to the Division of Historical Resources, the department includes the Division of Parks and Recreation, the Division of Forests and Lands, the State Library and the State Council on the Arts. What drew you to this new position? I’ve been living and working in New Hampshire for almost two decades, spending time in communities of all sizes, across the entire state and I’ve seen first-hand that our natural and cultural resources are places, experiences and treasures that define who we are and how we connect with each other. New Hampshire is famous for using grassroots support to get things done, including for historic preservation. I’m honored to be in a position to advocate on behalf of not just the NHDHR but all five of Department of Natural and Cultural Resources’ divisions every day. What are your priorities for the Department? Our mission at the Department of Natural & Cultural Resources is to protect, preserve and manage a wide variety of natural, recreational and cultural resources. One of my priorities is to ensure that our residents, workforce and visitors to our state have access to all of the above and have the very best experiences possible. We’re a full-service department in that we are dedicated to not only historical resources, but also state forests, libraries, arts organizations and artists, and our wonderful state parks (many of which are important from a historic preservation standpoint, by the way). While I’ll be helping our staff continue the excellent work they’ve done for generations, I’m also focusing on showing how all of the elements of the DNCR work together to provide what folks love about New Hampshire, and to raise awareness of all that we offer. What are some of your favorite historic buildings, communities or preservation success stories? That’s kind of a trick question because there’s so much to love in New Hampshire from a preservation standpoint. But the first thing that comes to my mind is our amazing town halls. I’ve had the opportunity to spend time at town halls all across the state. The history when you walk into them is palpable. They’ve served and continue to serve as inspirational backdrops for community gatherings and town hall meetings, and each one has its own unique charm. A few of my favorites include the Bedford Town Hall, the Peterborough Town Hall, the Canterbury Town Hall and the Sandown Town Office. 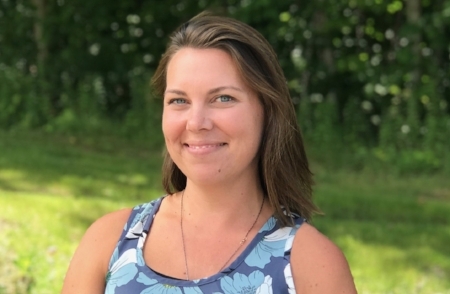 “Commissioner Stewart brings a passion for New Hampshire, experiences with collaboration, and creativity and communications skills to this job,” said Jennifer Goodman, executive director of the Preservation Alliance. Stewart has served on several boards, including Stay-Work-Play New Hampshire, Amoskeag Industries and N.H. Citizens for the Arts. She was also a member of the Commission to Study the Economic Impact the of Arts and Culture in New Hampshire, which, in the historic preservation section of its final report (2016), noted that, nationally, properties in historic districts have higher values and are better maintained; that neighborhoods with a mix of older, smaller buildings support greater levels of positive economic and social activity than areas dominated by newer, larger buildings; and that heritage travelers stay longer and spend more on average than other visitors.